Since 2016 the Boundary Way project have been running creative sessions with young people at Penn Fields Special School. 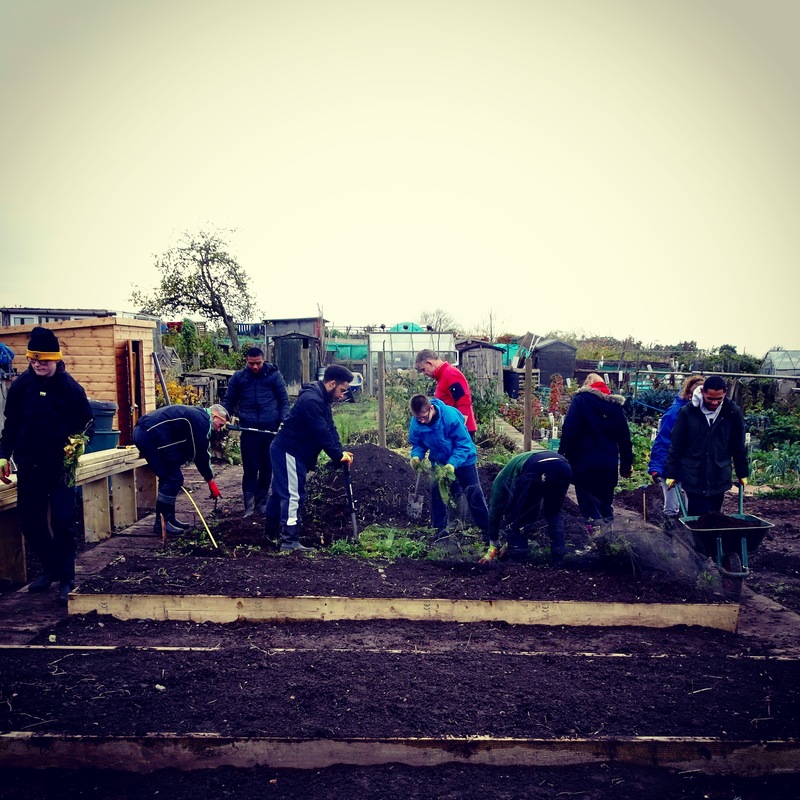 The workshops take place at Boundary Way Allotments and Community Garden, a beautiful green space next to the school with far reaching vistas across Staffordshire and beyond and lots of areas to discover. The site marks a boundary between the City of Wolverhampton and the County of Staffordshire. 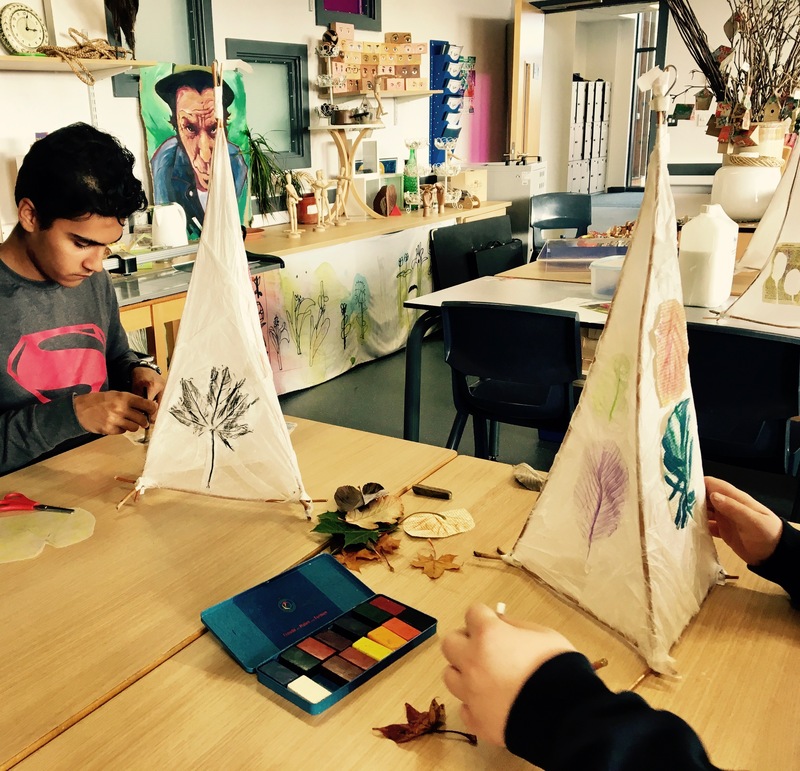 During 2017 the project piloted Arts Award Explore and Discover levels, made possible with support from Arts Connect and with further funding from Arts Council England, Heritage Lottery Fund and Penn Fields School. We worked initially with the school’s Sixth Form, a group of 11 pupils with severe learning difficulties and complex needs. 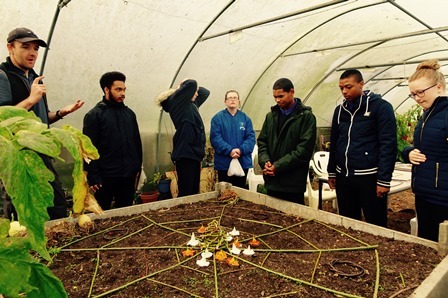 In a series of visits, the pupils explored different areas of the Allotments and Community Garden; an orchard, sensory planting, woodland area, storytelling space and the Camera Obscura. They frequently gathered in the large Polytunnel, a relaxing space where both learning and plants are nurtured and a cosy environment to shelter from the elements. In and around these spaces the group, gathered flowers to press, captured textures using a crayon rubbing technique and spent some reflective time listening carefully to the sounds all around them. IPads were used to record close up photographs of nature. The pupils were also asked to think of words that described how they felt when they visited the site. In the classroom I presented a selection of examples of my own collages, pupils asked questions about what an artist does and how the work was made and from this they each chose a favourite piece. With stage by stage demonstrations each of them made their own collages combining their nature photographs, crayon rubbings and a selection of recycled papers, finally adding the words they had chosen to express their feelings about Boundary Way. Running Arts Award alongside our wider arts and heritage programme helped us to bring a rich variety of artists and approaches together, offering the school links with the creative community in the city. Further insights into artist’s ways of working were given through stop motion animation workshops with filmmaker Geoff Broadway, lantern making with Adam and Maria Billington, a land art session with residency artists Richard Shilling and Julia Brooklyn, and a visit to Newhampton Arts Centre. Introducing Arts Award as part of our work at Boundary Way has added new context to our work and the young people have benefited from making links with the local community. As a result of our visit to Newhampton Arts Centre in Wolverhampton, the 6th formers were offered a chance to exhibit their work as part of a local photography festival, during July 2017, and this led to a further opportunity to show their work as part of a World Mental Health Day event at a city centre café – Wild Bytes. Pupils also benefitted from a workshop in portrait photography, generously donated by Neil Roberts at Aspects Photography. 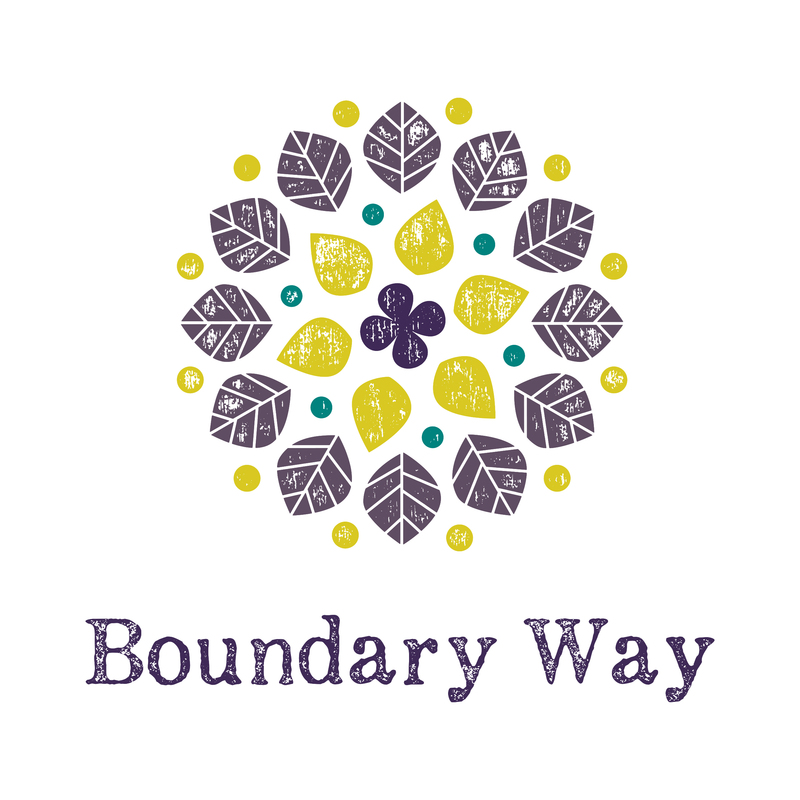 Our Arts Award work has been made possible due to the opportunity to collaborate with teacher Shelley McGregor, an arts specialist who recognises the importance of Boundary Way as a resource that supports SEN learning. Shelley and I have worked together to develop a range of resources to support learner needs – ranging from on site art materials storage to pictorial worksheets. It has also been invaluable to my own professional development to work closely with a SEN specialist. It has helped me to think about how to demonstrate ideas and processes to pupils with a wide variety of needs, and to think about non verbal ways of engaging. 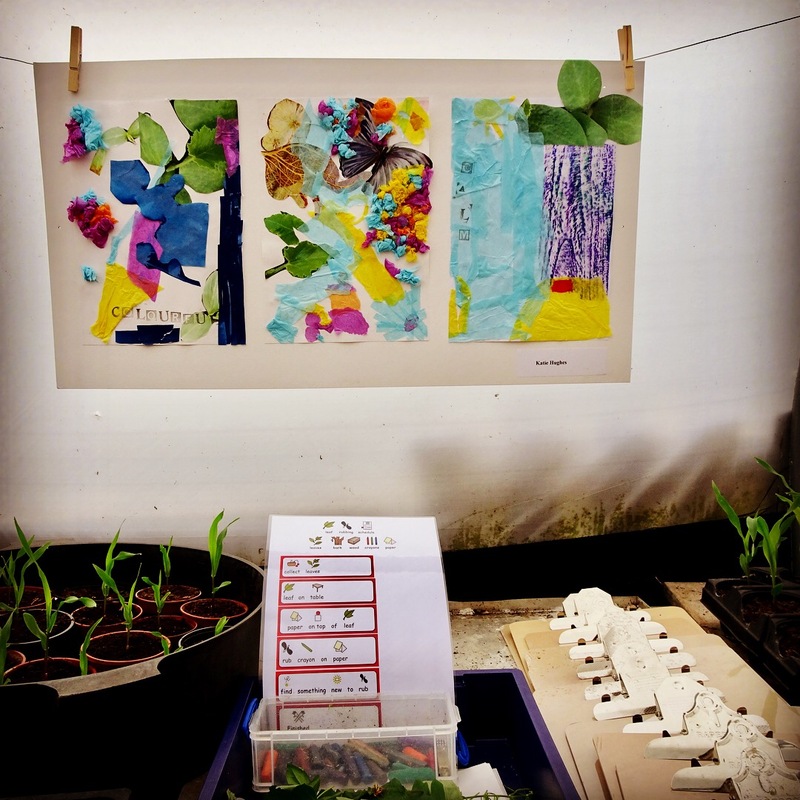 As we are both artists, the work with the children has fuelled our own creative practice too, spurring us on to make new work which we have exhibited during our project open days at the Allotment. Since our Arts Award Pilot we have worked with a further cohort in Key Stages 3 and 4 and these pupils showcased artwork to peers, staff and parents at a ‘Sensing Nature’ exhibition and Open Day last Summer. Arts Award also offers a recognition of achievement and accreditation to pupils who may not be able to access more formal qualifications. 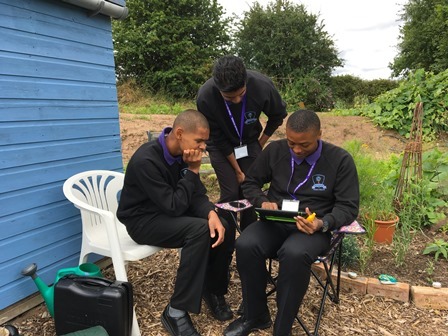 As a direct result of working with plot-holder Howard Berry, who runs regular gardening sessions with pupils from Penn Fields School as well as their work with the Boundary Way Project, the 6th form now have their own allotment plot on our site. It is an invaluable resource and focus for the curriculum, helping young people build confidence and independence and improving health and wellbeing. We are continuing to embed a creative outdoor curriculum in our project by working with local artists and researching new ideas and techniques. In particular we are developing activities using the natural resources we have. 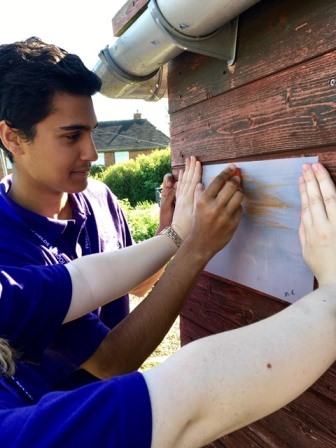 We are also focusing on raising awareness of the importance of connection with nature and avoiding using materials that could have a negative impact on the environment. I am really looking forward to new collaborations this year – the first of these will be hosting an exhibition of drawings and textiles in our Polytunnel called ‘The Beyondness of Bees’ with artists Sue Brisco and Elise Stewart this Spring. With further support from Arts Connect the Boundary Way Project team will be taking part in advisor training for Bronze and Silver Arts Awards soon as well as working towards securing funding and local partnerships to deliver a new programme. Teachers can access learning resources via our website and can download the Boundary Way brochure for further details of our work.